The Prince of Wales was welcomed by Fr Nadheer Dako, parish priest of the Chaldean Catholic mission in London. He met Neville Kyrke-Smith, national director of Aid To The Church In Need, whose mission it is support persecuted Christians worldwide. “You’re doing a fantastic job,” the Prince told him. And he talked with Archbishop Habib Bacha of Basra, who read a letter from Patriarch Louis Sako which urged the establishment of a refuge, a safe haven in the Kurdish area of northern Iraq where persecuted minorities might be able to begin their lives again. They have lost their histories, communities and identities, but they have their lives – if half-living in wretchedness and squalor and is any kind of life. The Chaldean choir sung, and the Lord’s Prayer was said in Aramaic, just as the Disciples might have heard it on the hills of Galilee two millennia ago. And then the Prince of Wales delivered a speech – quite a remarkable speech in many ways; spiritually profound, theologically nuanced and rich in compassion for those who are suffering for their faith. It wasn’t mentioned by the BBC or C4 News – he didn’t mention the Yazidis, you see. It was a speech of empathy, grace and humanity. His mind is clearly troubled; his heart is with the “unbearable suffering” and “indescribable agony” of Iraq’s Christians – a church which can trace its origins back to the ministry of Thomas the Apostle. Their eradication is “beyond belief”, the Prince said. It seems to me that all faiths to some extent shine a light on the divine image in every human life. If that is so, then surely to destroy another human being is to desecrate the image of the Divine, and to do so in the name of faith is nothing less than a blasphemy? As these truly dreadful images of executions and beheadings are transmitted around the world via the Internet I cannot help but feel that we are in serious danger, in this so-called modern age, of descending into the dark ages of public executions. The Apostle Paul, who went from being a persecutor to being persecuted, encourages us to be steadfast in faith. And, at this most agonising time we have to struggle not to forget that Our Lord called upon us to love our enemies and to pray for those who persecute. As you and your families know only too well, that is easier said than done. But by being with you this Christmas time I wanted to assure you of my constant thoughts and sympathy, and those of my family. As you know, the story of the Nativity ends with the Holy Family fleeing for refuge from persecution. You and your families are quite literally following in the footsteps of the Holy Family. My prayers, then, go with you that, like them, you too will one day be able to return to your own country, and to the place that has nurtured both your life and your faith. In the meantime, you can have no idea how much I feel for those who, as I speak, are suffering for their faith in such terrible circumstances. The Prince of Wales is preoccupied by the suffering of Christians in the same way as St Luke was preoccupied by the suffering of Jesus (Lk 22:15; 24:26, 46 cf Acts 3:18; 17:3). The Prince empathises with the anguish and agony of persecuted Christians; Luke places great emphasis upon Isaiah 53. There are distinct parallels between Jesus’ ministry and apostolic ministry: eg Stephen’s trial mirrors that of Jesus (Acts 6:8-15 cf Lk 22:66-71 and esp. Acts 7:56 cf Lk 22:69); Paul’s passion (Acts 21:1-14); and the inevitable suffering of the disciples through persecution (Lk 21:12-19 cf Acts 6:9ff; 7:60; 12:2). Luke recognises that, just as the way of Jesus took him through opposition culminating in judicial murder, so too the path of the Word of God is beset by opposition. Persecution and suffering offer an opportunity for gospel witnessing (Acts 6:10 cf Lk 21:12-15); indeed, persecution led to the flight not only of the Holy Family from Bethlehem, but of many Christians from Jerusalem, thus assisting the spread of the gospel throughout Judæa (cf Lk 9:5). As you read the Acts of the Apostles, by the middle of chapter nine it is apparent that fleeing persecution and suffering resulted in churches being established throughout Judæa, Galilee and Samaria, and by chapter 20, throughout most of the Eastern Mediterranean. The restoration of the Kingdom of God is an eschatological expectation. 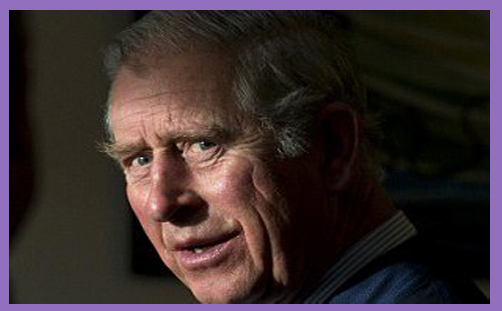 The Prince of Wales engenders hope through the apocalypse and urges steadfastness through suffering. The Temple may have been destroyed, but the End is not immanent, even though it must surely feel that way for Believers in Iraq and throughout the Middle East. In the meantime, we have the joy of a Chaldean Christian community established in Acton with its own eschatological insights, and they pray in Aramaic for the Parousia. As the Prince of Wales left the church, Maijida Nissan said: “I am very happy that he came here, and thanks to God that he came here.” And we are happy, too, that 4000 Chaldeans may live safely among us, helping to spread the light and love of Christ in London, and to England, and to the United Kingdom, and thence to Europe and, God willing, to the ends of the earth.